CMS Proposed New TAVR Coverage Decision Memo: A Gift to Low-Volume Cardiac Surgery Programs? CMS announced its long-awaited updated transcatheter aortic valve replacement (TAVR) national coverage determination (NCD) proposal on March 26, 2019. Based upon the proposed changes from its original May 2012 coverage determination, the updates, if formally adapted, could be a gift to low-volume cardiac surgery programs – and lower-volume cardiology programs in general – nationwide! The pressure was on CMS to increase access to and availability of TAVR for more hospitals from the hospital industry by lowering the existing volume requirements. The counter was the professional societies that believed keeping, or even strengthening the current requirements would help insure a quality product (the classic volume = quality issue). It appears the mounting years of TAVR study data highlighting safety and efficacy has strengthened the hospital industry’s case and helped it win the debate over balancing access and outcomes! The proposed CMS decision memo outlines specific hospital infrastructure requirements, such as needing on-site heart valve surgery and interventional cardiology programs, along with a post-procedural intensive care unit experienced in managing patients following open-heart valve procedures. At least 50 open-heart surgeries in the year prior to starting a TAVR program. At least 20 aortic valve-related procedures in the two years before program initiation. Under the current NDR, 25 AVRs in one year, or 50 AVRs in two years prior to new service. At least 300 percutaneous coronary interventions (PCIs) per year. Currently, greater than 400 PCIs per year. Current requirement for 1,000 catheterizations per year has been deleted. At least two cardiac surgeons, including one with at least 100 career open-heart surgeries and 25 aortic valve surgeries. An interventional cardiologist with at least 100 career structural heart procedures or at least 30 left-sided structural procedures annually, along with device-specific training from valve manufacturers. Currently, surgeon also had to have 30 left-sided structural procedures of which 60% had to have been balloon aortic valvuloplasty. At least 50 AVRs (TAVR or SAVR) annually or 100 every two years, including 20 or 40 TAVRs over those respective timeframes. 300 or more PCIs per year. At least one interventional cardiologist and two cardiovascular surgeons on staff. Another proposed change from the current national coverage determination (NCD), is that CMS would require just one surgeon to sign off on the multidisciplinary evaluation for TAVR, SAVR or palliative care. The current NCD requires a two-surgeon signoff. Again, a gift to smaller volume programs. The 30-day public comment period on the proposal is now open and CMS plans to make a final decision on the NCD within 60 days of the comment period ending. Low-volume cardiac surgery programs could benefit from the decreases in required volumes for combined SAVR, overall catheterization procedures, PCIs and going-forward TAVRs under the proposed NCD. If adapted, these changes will significantly impact entry into this new market. CFA has several client hospitals that are following these developments closely, on the cusp of making a decision to move forward – unable to meet the existing requirements, but probably able to meet the proposed changes. We have written extensively about the TAVR question – whether or not to proceed with TAVR under the best of circumstances. Structural heart services[i] including TAVR (and also transcatheter mitral valve repair/replacement) are complex and demanding services. Beyond the question of “can we meet the current and/or proposed standards,” comes the larger, more complex question of “should we enter this market?” With the latter question, each hospital will have to assess its own corporate strategy, internal existing/potential volumes, referral patterns and practices, payer mix/procedural cost/reimbursement, capital investment, operational capabilities, competition within the marketplace, physician leadership and capabilities, and other pertinent questions. If you are interested in learning more about low-volume cardiac surgery programs strategies, please download our updated and expanded white paper (see Low-Volume Cardiac Surgery Programs: Grow, Consolidate or Divest: Self-Preservation Strategies and Excellence Expectations). If you are interested in cardiac services strategic development, service expansion and/or other programmatic needs for cardiovascular or other services, please contact CFA at (949) 443-4005 or by e-mail at cfa@charlesfrancassociates.com. [i] See also Valve Surgery Trends and Implications, posted June 28, 2018, and Mitral Valve Surgery Trends and Implications, posted March 14, 2019. In our continuing series on low-volume cardiac surgery programs (LVCS), we previously discussed structural heart programs and the importance of valve surgery volumes in the overall assessment of potential cases. (Refer to Low-Volume Cardiac Surgery Programs: Valve Surgery Trends and Implications, posted 6/28/18). 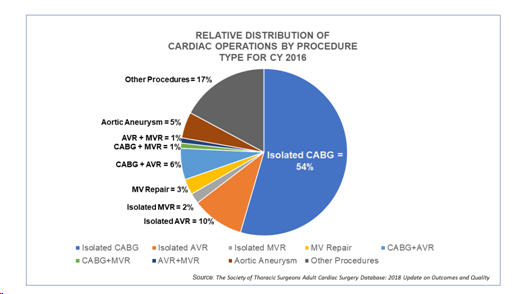 While the distribution of cardiac surgical cases presented in the The Society of Thoracic Surgeons Adult Cardiac Surgery Database: 2018 Update on Outcomes and Quality (based on 2016 data) favors isolated CABG (54% of total), total valve cases – inclusive of combined CABG/valve procedures, aortic valve replacement (AVR), mitral valve repair/replacement and combined aortic/mitral represent a significant total of 24% of the total cardiac surgery cases. Increasingly, open-surgical procedures for AVR are being supplanted by transcatheter procedures, applicable to lower risk patient cohorts, which have a direct impact on overall hospital surgical volumes given the current regulatory limitations placed on hospitals to perform such procedures. Cardiovascular research literature clearly affirms the use of TAVR will continue to grow. With a prevalence of 4.5%, an estimated 16.1 million people aged ≥60 years across 37 advanced economies have aortic stenosis. Of these, there are ≈1.9 million patients eligible for surgical aortic valve replacement and 1.0 million patients eligible for transcatheter aortic valve replacement. Like transcatheter aortic valve replacement (TAVR), mitral valve surgery, while a minority of total procedures, is being increasingly impacted by transcatheter procedures that, like TAVR, will have an impact on overall hospital volume of cardiac surgery cases either directly (by adding or deleting volume) or indirectly (by leakage or referral to TAVR/TMVR centers). A recent large scale worldwide market assessment conducted by the global research firm Business Communications Company (BCC) showed transcatheter mitral valve repair (TMVR) accounted for just 12 percent of transcatheter aortic or mitral procedures in 2017, according to the report, but are expected to grow faster over the next few years than the more established field of transcatheter aortic valve replacement (TAVR). In 2023, BBC research predicts TMVR will account for 22 percent of the segment while TAVR will claim the other 78 percent—down from 88 percent in 2017. New interventional technologies, including Abbott’s MitraClip® and potentially Tendyne™ devices, will have the same, potentially profound impact on MVR, as TAVR devices did on AVR. Therefore, it is important to consider both AVR and MVR strategies in the overall development of cardiac surgical programs, valve programs in particular, and LVCS programs especially. Admittedly, mitral valve procedures currently represent a small total cardiac surgery volumes. Referring to the STS data for CY 2016 referenced earlier, mitral valve replacement totaled 7,592, repair totaled 8,619 (total 16,211). In addition, combination CABG plus MV repair/replacements totaled 6,349, for a grand total of 22,560. These procedures represent approximately 13% of total adult cardiac surgeries during the reporting period. Depending upon the diagnosis, anatomical specificity, extent of damage, etc., the definitive treatment has historically relied on surgical repair or replacement with a bioprosthetic (tissue) or mechanical valve through a surgical approach for both MVP and MVR. Stenosis can be treated with balloon valvuloplasty in many cases and is relatively rare. Some large surgical centers are using robotics to repair valves. Clinically, “MV repair is preferred over MV replacement whenever possible. “ Of particular note is the belief that mitral valve replacement, and particularly repair, is a complex, clinical challenging, highly technical procedure heavily dependent upon both individual operator skill and organizational development and capacity to produce quality results. LVCS programs that commit to valve programs are taking on a considerable challenge. Transcatheter devices for valve repair and replacement have been approved for MVR since 2013 for the highest risk patients and are steadily supplanting open surgical approaches. New and evolving technologies are also now in clinical trials. Two are summarized below. Abbott’s MitraClip technology, approved in 2013, now in its third generation, is a transcatheter-delivered device used to repair leaky mitral valves and has been used in over 65,000 patients worldwide over the last ten years. Mitral valve regurgitation, or leakage, is the most common mitral valve problem. MitraClip is appropriate for the patient that would be the highest risk surgical candidate. A new transcatheter device, Tendyne, has been initially studied in Europe, and is has entered clinical evaluation with the SUMMITT trial in the U.S. as of July 2018. This device is the first and only MR valve replacement that is repositionable and fully retrievable to allow for more precise implantation, with the hope of improving patient outcomes. The study will enroll up to 1,010 patients in 80 sites in the U.S., Canada, and Europe. The initial results of the European trial, released in May 2018, were promising. Why should a LVCS program worry about a low-volume procedure such as mitral valve surgery, particularly when these patients tend to be referred (or self-refer) to high-volume, specialized valve surgery programs capable of utilizing the latest transcatheter technology and marketing themselves based on expertise and excellent clinical outcomes? The answer is straightforward. LVCS programs must aggressively (but realistically) understand the total market for cardiac surgery, its component clinical procedures, the overall market for these procedures, and their current and potential role in this market. If there are patients that are being referred or leaking to competing programs, why are they going? If it is a question of programming, clinical expertise, outcomes and/or technology, can these issues be successfully addressed to the concerned hospital’s advantage? If so, what specifically would need to change? For most hospitals with a clear market opportunity the key strategic driver will be access to a skilled TMVR Cardiac surgeon with the right training and expertise. If not, are there ways to compensate for a “disadvantaged situation?” For example, some hospitals without TAVR capability or minimum volume have negotiated arrangements with TAVR providers to do all pre- and post-TAVR diagnosis and follow-up short of the actual TAVR procedure itself. Thus, they retain at least a portion of the TAVR patient business. Could mitral valve cases be “retained” in a similar fashion? It is well worth thinking about. CFA has successfully worked with both low- and moderate-volume cardiac surgery programs to assist them in evaluating structural heart program development. This work has focused on capturing as much available heart valve surgical volume as possible in the hospitals’ situation. This assistance has included market analyses, strategy development, “readiness” assessment and program implementation tactics aimed at either starting a new program, or building upon an existing program. It is important to understand the current market, the exact clinical nature of the potential cases that are being lost to competitors, and the existing and required programmatic and clinical capabilities that will be required to re-capture this important market. If you are interested in learning more about low-volume cardiac surgery programs strategies, please download our updated and expanded white paper (see Low-Volume Cardiac Surgery Programs: Grow, Consolidate or Divest: Self-Preservation Strategies and Excellence Expectations, our expanded and updated White Paper). If you are interested in cardiac services strategic development, service expansion and/or other programmatic needs for cardiovascular or other services, please contact CFA at (949) 443-4005 or by e-mail at cfa@charlesfrancassociates.com. D’Agostino, et al. The Society of Thoracic Surgeons Adult Cardiac Surgery Database: 2018 Update on Outcomes and Quality. Annals of Thoracic Surgery 2018; 105; 13-23. Note that the distribution of procedures by type included in this update is for CY 2016 data. Whether or not current minimum volume requirements tied to Medicare reimbursement will be changed by CMS in FFY 2019 is open to speculation as it is currently under active consideration. Nishimura R.A., et al, 2017 AHA/ACC Focused Update of the 2014 AHA/ACC Guidelines for the Management of Patients with Valvular Heart Disease: A Report of the ACC/AHA Task Force on Clinical Practice Guidelines, J. Am College of Cardiology 2017; 70: 252-289. Abbott Begins Tendyne Transcatheter Mitral Valve U.S. Pivotal Trial, Abbott Laboratories press release; July 26, 2018. While low-dose coronary artery calcium scoring scans (CAC) using CT have been around for some time, their effectiveness and relatively low cost in assessing cardiac risk seems to be taking on a new life. Accumulated wisdom and several newer studies have added to the body of clinical knowledge about CAC. These newer studies have done much to further validate its effectiveness in assessing cardiac risk in certain population groups. Because of this, CAC is being increasingly adopted by the medical community and many hospitals as an excellent screening tool to identify potential patients at moderate to higher risk for coronary artery disease (CAD). This blog will highlight these new findings and conclusions with links to the published studies. We also present a case study of a CFA client hospital that has effectively adopted CAC as a means to build public awareness along with offering a low-cost opportunity for the local and regional public to access a well-coordinated cardiac screening program. Here is a summary of some salient conclusions from past and more recent studies about CAC. Low-dose CT calcium scoring tests offer physicians an effective way to address patients whose risk for CAD is the “gray zone” or middle of conventional risk approaches such as the Framingham Risk Score or Pooled Cohort Equations. Calcium scoring allows physicians to have additional risk evidence to be able to convince patients at risk that, for example, statins and aspirin regimens are right for them beyond recommended diet and exercise strategies. The picture produced by CT scans, showing visible calcium deposits, can be very convincing to patients who may be reluctant to start a drug regimen. To date, CAC screening has been studied in 100,000 patients, including large prospective studies with 15-year follow-up. Additionally, there are in excess of 1,000 peer-reviewed articles on CAC from single-site studies, multi-facility cohorts, and randomized trials. Data from the PROMISE[i] trial concluded that CT calcium scoring predicted events just as well as functional testing (such as stress testing or nuclear scanning), at a much lower price, and was easier to use. Other studies, including MESA[ii] (Multi-Ethnic Study of Atherosclerosis, The Dallas Heart Study, and others have produced similar conclusions as the PROMISE study, and support increased usage of CAC as a viable risk-assessment strategy. The newly released ACC/AHA blood cholesterol guideline[iii], for the first time setting specific LDL targets, specifically identifies CAC as a viable and cost-effective method of identifying and tracking calcium deposits and visually incentivizing at-risk patients to aggressively treat high cholesterol levels. Many hospitals charge as little as $50 for a CT calcium score study. This is a subsidized price designed to be attractive to the population and reduce barriers to enrollment. A full CAD screening program is often offered for $99 to $150 (see case study below for components). Low-dosage CT can be used serially to show changes in calcium over time. Scans have shown the reversal of disease over time to patients who have made an aggressive commitment to diet, exercise and statin use. Some believe that serial CT scans to document calcium scores and interventional strategies will become common practice (and clinically justifiable to payers for reimbursement) in the near-term future. A quick, non-scientific review of hospital websites by CFA shows that these types of programs are becoming increasingly common. The overall design of these programs, required screening components, and overall operation is straightforward and fairly easy to replicate by other facilities. CFA has been working with a regional hospital cardiac program to re-energize its program. The hospital has developed and implemented a very successful public awareness and cardiac screening program incorporating CT CAC and promoted through a comprehensive regional marketing program that uses radio and print media. 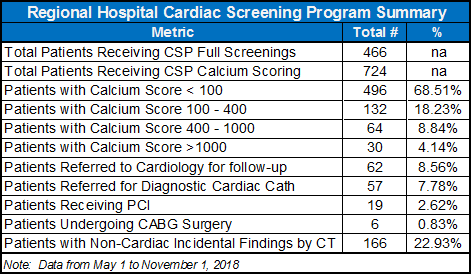 From program inception in May 2018 until November 1, the program screened 724 patients along two tracks – a comprehensive cardiac screen protocol including a CAC scan and a CAC scan-only screening exam. The table below presents the actual number of patients screened in the 6-month period, their various levels of calcium scores and other vital statistics from the program. Note that the screening has resulted in a significant (and appropriate!) number of referrals for both physicians and the sponsoring hospital. In this regional patient population, the percentage of patients needing further follow–up and/or study has been trending at 16-17% and those needing an intervention (PCI or CABG) at 3-4% respectively. A full screen for self-referring patients includes a risk evaluation, body composition/BMI, blood pressure evaluation, CT CAC scan, resting ECG, lipid panel, and hemoglobin A1C test, and is offered for $99. Physician referrals are accepted for CT heart scans only and is offered for $50. The CT scan is administered by Radiology and the non-cardiac portion of the scan read by radiologists. The CAC study is read by qualified hospital cardiologists. Critical to the success of any such program is widespread communication and endorsement among physicians and administration on the plans for the program and the role each participant is to fill. Basic to this premise is the support of the local and regional referring primary care physicians (PCPs) who will need to be educated on the efficacy and effectiveness of CAC. Communication and cooperation ensure that the maximum number of potential referrals are captured and that important feedback on both individual patient participation and overall program performance is enhanced. As can be seen, CT calcium screening can be a highly effective screening tool at a very reasonable price. Virtually any hospital with the technical and clinical capability, involvement of trained and capable physicians and the will to succeed can develop a successful program that will enhance public awareness of coronary artery disease and the importance of early detection. One interesting finding emerging in some recent CAC studies is the ability of CAC to identify a sub-population of asymptomatic, low CHD risk individuals who have exceptionally high coronary calcium and, therefore, are at greater risk for serious coronary events. Please see the American Journal of Medicine article on this topic here. If you are interested in learning more about cardiac screening programs, cardiac services strategic development, clinical service expansion and/or other programmatic needs for your cardiovascular program, please contact CFA at (949) 443-4005 or by e-mail at cfa@charlesfrancassociates.com. [i] Matthew J. Budoff, et al., Prognostic Value of Coronary Artery Calcium in the PROMISE Study (Prospective Imaging Study for Evaluation of Chest Pain), Circulation, Vol. 136, No. 21, 2018. [ii] Silverman, MG, et al., Impact of Coronary Artery Calcium on Coronary Heart Disease Events in Individuals at the Extremes of Traditional Risk Factor Burden; The Multi-Ethnic Study of Atherosclerosis. European Heart Journal, 2014 Sep 1;35 (33): 2232-41. [iii] Grundy, Scott M., et al; AHA/ACC/AACVPR/AAPA/ACPM/ADA/AGS/APhA/ASCP/NLA/PCNA Guideline on the Management of Blood Cholesterol, Circulation, 2018; DOI 10.1161. [iv] Hecht, Harvey, et al. Clinical Indications for Coronary Artery Calcium Scoring in Asymptomatic Patients: Expert Consensus Statement from the Society of Cardiovascular Computed Tomography; J. of Cardiovascular Computed Tomography, published online 24, January 2017, pgs. 157-158. In the previous blog post (refer to Rethinking Ambulatory Cardiovascular Strategy: Part One – The Big Picture posted on 4/19/18), I discussed the rationale for the need to reconsider your ambulatory strategy. From the perspective of the cardiovascular service line administrator, let’s look at example approaches and some real world situations to illustrate these issues. 1. Adapt Rapidly to Changing Technology – Options for treating patients on an ambulatory basis are continuously expanding. Be attuned to these changes and move as rapidly as is feasible to adapt and change. Note that the transition period could lead to an unintended consequence – a short-term drop in (inpatient versus outpatient) revenue – but will yield long-term incremental results. Example: Creating same-day discharge PCI programs using/expanding transradial arterial access.Transradial access lowers bleeding complication rates; access closure is more reliable with pressure alone (without closure devices); and earlier patient ambulation helps reduce nursing time required per patient. Research in example hospitals has shown a savings of from $1,200 to $1,900 per case when radial access is used. Estimates of the use of radial access in the U.S. are currently in the 25% range, with wide variation by geographic location. 2. Incorporate Best Practice Guidelines. The latest expert consensus documents, incorporating best-practice guidelines, protocols and algorithms, inclusive of their recommendations, should be incorporated into hospital care practices and revised policies and procedures. More specifically, patient risk-assessment/stratification and resultant treatment recommendations, applicable to those patients that can be treated safely and effectively on an ambulatory care basis. Example: Case selection criteria for hospitals performing PCI without on-site surgical backup. The SCAI/ACC/AHA Expert Consensus Document – 2014 Update on PCI without On-Site Surgical Backup documents the recommendations for patient selection, treatment and potential transfer. This assists the attending physician in making clinical decisions, including ultimate judgements about ambulatory versus inpatient versus transfer-out treatment planning. 3. Re-Engineer Care. Re-engineering patterns of care, particularly across the continuum in an episode of care model, is critical to financial success. Integral to this process is the clinical discussion that should take place to evaluate each patient category, apply the most progressive care practices, identify barriers to success and gaps in performance, and make appropriate changes. Inherent in this process is the identification of outpatient treatment opportunities, either through the application of best-practice guidelines and protocols, or locally-derived care practice improvement efforts. Example: Many hospitals have successfully re-engineered their heart failure care by assigning case managers and implementing rapid-response to patient follow-up – including telephonic monitoring, cardiac rehab, outpatient clinic visits and other ambulatory approaches. Particularly applicable to bundles, such programs have successfully decreased inpatient stays, readmissions, ED visits and overall cost per case, while stressing carefully managed ambulatory processes. Example: Cardiac rehabilitation programs reduce readmissions and save money, but most patients don’t participate. Maximizing rehab participation can have a dramatic impact on overall utilization and must be a key part of any ambulatory strategy. Ensuring that physicians stress its importance and incorporate cardiac rehab referrals for their patients can aid in increasing participation. 4. Enhance Physician Strategy. No ambulatory care strategy is complete without physicians, both PCP’s and cardiovascular specialists. Increasingly, hospitals and health systems are having difficulty recruiting top talent both to staff expanding primary care networks and the CV service-line. Integrating physicians into the organizational and operational infrastructure of the service-line and incentivizing them through appropriate vehicles should inevitably lead to stronger ambulatory approaches, while mitigating potential efforts by physicians to directly compete for ambulatory business with hospitals. Ambulatory hospital-physician integration strategies are structured along a minimalist to maximum continuum: from professional physician services agreements to cover outlying clinics with diverse geographic coverage, to co-management agreements (see example below), to compliant JV outpatient facilities, to employed physician arrangements. Example: Simple Integration through Co-Management Agreements. CV physicians participating in co-management agreements can be legally incentivized to address a specific set of priority goals and objectives, including prioritized ambulatory strategies custom to the organization. Examples are numerous, such as staffing outreach clinics, developing best-practice protocols/policies and procedures, re-engineering care, lowering cost per procedure, enhancing patient experience, hitting a target percent of outpatient versus inpatient cases, and others. 5. Minimize Leakage. Ambulatory strategy suggests that the hospital needs to capture and retain its fair share of this market. Building utilization by keeping patients within the system results from offering services that are accessible, geographically located and medically appropriate, as well as managing individual care to maximize clinical effectiveness and overall patient care experience. Example: Case Managers/Care Coordinators/Nurse Navigators. To prevent leakage, many hospitals have re-engineered care through the use of case managers who are responsible for individual patients throughout the entire episode of care. They insure patients are linked to appropriate providers, follow-up appointments are scheduled, and patient experience is enhanced. Additionally, minimizing readmissions through case management has proven to be very successful. 6. Improve Interoperability/Optimize the CVIS. Increasingly, interoperability issues with and between information technology systems are present in ambulatory development – between inpatient and outpatient systems, physician practices, and off-campus facilities – and even within the hospital’s cardiovascular information system (CVIS). Historically, inpatient and outpatient data management have utilized different IT platforms. Increasingly, systems will need to be adapted to monitor and manage patients between facilities – in real time -- throughout an episode of care. At the service-line level, CVIS optimization is a significant problem that can impact all levels of patient care, physician reporting and information generation for ongoing operations management. Example: Proprietary Episode of Care Case Management Platforms. New IT platforms are being designed to facilitate the management of individual cases over a defined episode of care with interoperability between networked facilities and real-time reporting. Primarily used by case managers, they seek to coordinate inpatient and outpatient utilization to maximize efficiency, effectiveness and overall cost of care. Example: Optimization of CVIS. Most hospitals have invested in state-of-the-art data collection and reporting systems for their cath lab, cardiology and vascular services which offer structured reporting – either with or without cardiovascular picture archiving and communication systems (CPACS). Many are still dysfunctional. Optimization projects focus on customizing interfaces with hospital IT systems, structuring and customization of reporting templates for local physicians, and maximizing technology to support existing clinical work flow. The efficient operation of CVIS can have a dramatic impact on ambulatory work flow. 7. Continue Ambulatory Facility Development. While “right-sizing” facilities for the ambulatory challenge is a big picture issue – and a high priority given budgetary implications – the CV service-line administrator must optimize utilization of existing facilities, while actively participating in the planning of new, expanded/relocated, geographically disparate outpatient capabilities. Additionally, robust planning needs to occur to adapt to new technology and incorporate rigorous risk-stratification/patient selection criteria for all procedures to produce the highest percentage of outpatient-appropriate patients. Example: Lowest-Cost Setting. A teaching hospital with a full-service cardiovascular program purchased a rival “heart hospital” near its main campus for use as an ambulatory care and short-term surgical facility. This facility has a fully-licensed cath lab. With the goal of utilizing the lowest-cost setting to lower its cost per case, the main hospital’s cath lab manager is attempting to schedule elective diagnostic caths at the other facility to free-up its main cath lab schedule, enhance the patient experience and lower the overall costs of routine scheduled procedures. As inpatient volumes are impacted by ambulatory strategies, and value-based reimbursement and episode of care models continue to proliferate, hospitals will be challenged to provide appropriate access to care through ambulatory facilities. Cardiovascular services play a vital role in such strategies through maximizing the appropriate applicability of outpatient-related services, the distribution of services among its geographic market area, and the operation of such services to maximize both physician participation/integration and the overall patient experience. Service line administrators have a vital role to play in this strategy development. If you are interested in learning more about ambulatory strategies, bundled pricing, cardiac services strategic development, service expansion or low volume cardiac surgery programs and/or other programmatic needs for cardiovascular or other services, please contact CFA at (949) 443-4005 or by e-mail at cfa@charlesfrancassociates.com. Sometimes being a California company lulls one into a false perception of normalcy. Because of the State’s years as a highly competitive managed care environment, one tends to think that the rest of the country has experienced similar market pressures and developed similar responses. Accordingly, California hospitals have developed a robust ambulatory strategy – admittedly aided by the state mandate requiring hospitals to replace non-earthquake compliant facilities and thus facilitating the reconfiguration of in- and outpatient capacities. Although key drivers of outpatient growth include reimbursement trends, the search for the “lowest-cost setting” and persistent technologic change, another major factor relates directly to hospital facility design limitations. The vast majority of hospitals in the U.S. were designed and constructed as inpatient facilities with limited outpatient capacity. As hospitals are forced to redesign, replace, expand and adapt to changing utilization, their facility design – hospital, dedicated outpatient, ASCs, on-campus, off-campus, other – will need to emphasize patient access, significant outpatient orientation and capacity. This approach, focusing on organizational and facility solutions (essentially addressing ambulatory capacity issues), is fundamentally “big picture” ambulatory strategy that is best addressed at the health system level. As outpatient volume grows, and supporting reimbursement established, so do the number and type of hospital competitors for this business – especially physician competitors. The growth of Ambulatory Surgery Centers (ASC), Office-Based Labs (OBL), ambulatory cardiovascular centers and other options is undeniable. The growth of physician-owned/controlled OBLs for example (particularly applicable to peripheral interventions) has been explosive, with an estimated 500+ labs open and 25 new labs opening each month. While the issue may be obvious, the successful solution(s) are much more complex. How does one balance inpatient and ambulatory strategies? What unique circumstances and market characteristics challenge optimal strategy development? 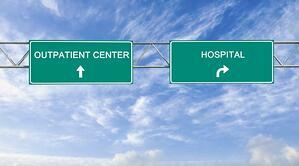 Will physicians pre-empt hospital strategy through direct competition for outpatient business? How does one handle the transition period when maximizing revenue is all important? Are facility limitations holding us back? Has patient care re-engineering maximized the in- and out-patient mix, or is it just starting? How do we maximize patient access and convenience with regional strategy? Past solutions have tended to look at the “big picture” and focused on the implementation of organizational/facility solutions to add necessary ambulatory care capacity (while optimizing reimbursement), such as establishing ASCs, dedicated outpatient facilities, off-campus geographically dispersed clinics, working with physician groups to support ambulatory utilization (and dissuading the establishment of competing ventures like OBLs), and the like. In the second part of this blog post, I will address example approaches to enhancing ambulatory strategy directly at the hospital level and within the purview of the cardiovascular service line administrator. As ambulatory strategy becomes increasingly important, and value-based reimbursement and episode of care models continue to proliferate, hospitals will be challenged to provide enhanced access to care through ambulatory facilities. Cardiovascular services play a vital role in such strategies through maximizing the appropriate applicability of outpatient-related services, insuring access through the distribution of services within its geographic market area, and the operation of such services to maximize both physician participation, integration and the overall patient experience. If you are interested in learning more about tactics to deal with ambulatory strategies, bundled pricing, cardiac services strategic development, service expansion or low volume cardiac surgery programs and/or other programmatic needs for cardiovascular or other services, please contact CFA at (949) 443-4005 or by e-mail at cfa@charlesfrancassociates.com.